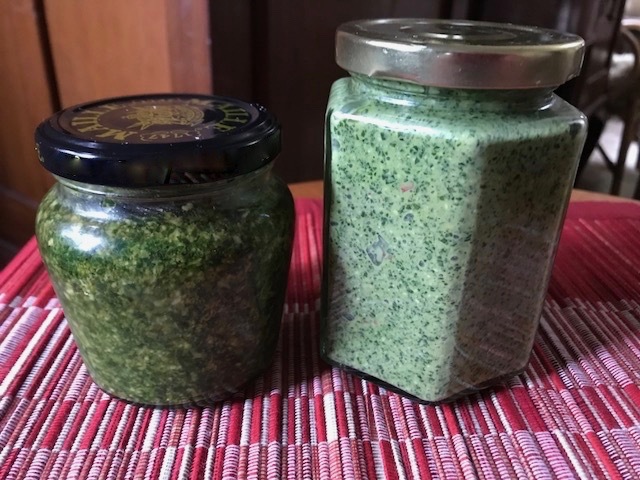 Basil pesto on the left, mixed herb pesto on the right. I’ve been on a pesto binge lately. First I made a batch of ordinary basil pesto (fresh basil, pine nuts, garlic, cheese, olive oil, a squeeze of lemon & some salt & pepper) and then a couple of days later I made a much larger batch of mixed herb pesto, because fresh herbs were on a special at my supermarket and I bought a pile. So, 2 bunches of coriander (cilantro), 2 bunches of basil (leaves only), one bunch of mint leaves, some parsley, the zest and juice of 2 lemons, a cup of pine nuts, about 8 cloves of garlic, 2 chillis (they weren’t super hot, hence two instead of one) olive oil, a couple of spring onions, and salt and pepper to taste. I’m a taste-as-you-go sort of cook, and kept adding things, hence the spring onions, extra garlic and chilli, and I also added a squeeze or three of lime juice and a good squirt of chilli sauce, because I wanted a little bit more zing. And no cheese in this one as I wanted to give some to a dairy-allergic friend. I had it for dinner with soba noodles and it was yummy. And then at lunch time I spread it on toast and topped it with some leftover chicken. Also yummy. Pesto is so easy. Just put it all in a food processor and whizz. For the basil pesto I toasted the pine nuts, for the mixed herb one I didn’t. Maybe that’s why it looks lighter. Or maybe it’s because I used more pine nuts, and also mint, which is lighter. Who knows? Whatever, the taste certainly isn’t lighter. I’m very happy with both.